The patient, the aforementioned young woman had no significant past medical history. She initially presented to a small tertiary facility with chest pain. She was evaluated for acute coronary syndrome and discharged from the emergency department. She subsequently miscarried an early pregnancy. Several days later, her symptoms intensified, and she became short-of-breath so she returned to the emergency department. On chest radiograph, she was found to have a large left-sided pneumothorax. A chest tube was placed but subsequent radiographs showed a persistent pneumothorax. The nearest trauma facility was notified and the patient was transferred for further evaluation and treatment. On arrival, the patient who was experiencing significant chest and LUQ pain, and breathlessness received a second chest tube. Following chest tube placement in the emergency room, chest radiograph showed the pneumothorax to be unchanged. The patient was admitted to the hospital for further testing. A CT scan (TAC) of the chest showing chest tubes in good position and several large blebs. Following the CT scan, thoracic surgery was consulted for further treatment and management. After discussing the risks, benefits and alternatives with the patient and family, the patient elected to proceed with a left-sided VATS (video-assisted thoracoscopic surgery) with blebectomy and talc pleurodesis. Patient received pre-operative low dose beta blockade for sinus tachycardia. Patient was intubated with a double lumen ETT for uni-lung ventilation. The patient was hemodynamically stable intra-operatively, and the case proceed without incidence. 12 grams of sterile talc was insufflated using an aerosolized technique. A new chest tube was placed at the conclusion of the case. There was minimal to no operative blood loss. 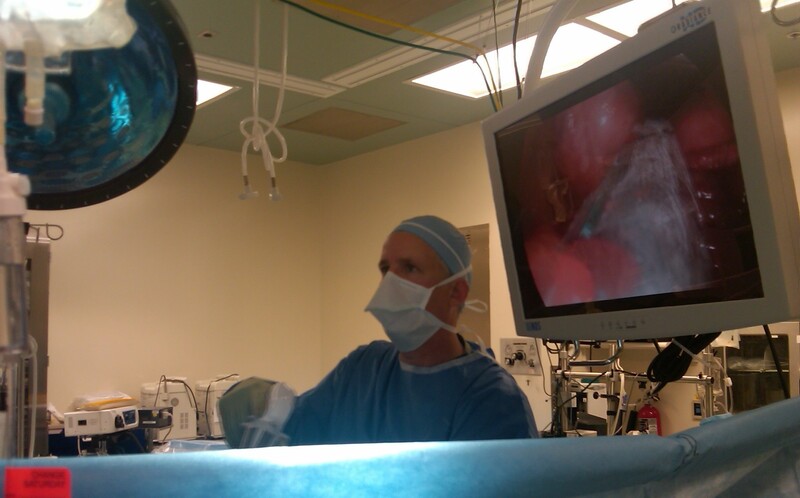 The patient was awakened, extubated and transferred to the post-operative recovery unit. Chest radiograph in recovery showed the lung to be well expanded on -20cm of suction. Post-operatively the patient had a small airleak. She was maintained on suction for 48 hours and watersealed. Waterseal trials were successful, and on post-operative day #4, chest tube was removed. Subsequent chest x-ray was negative for pneumothorax. Patient was discharged home with a follow-up appointment and a referral to OB-GYN for additional follow-up. Discussion: Due to patient’s history of miscarriage in close proximity to first reports of chest pain, special consideration was given to the possibility of catamenial pneumothorax (though this was first instance, and on the left whereas 90% of reported cases occur on the right.) While the literature reports previous episodes of pneumothorax during pregnancy, these reports occurred in later gestation (37 and 40 weeks, respectively.) On further evaluation, patient had no history of abnormal vaginal bleeding, pelvic infections, pelvic inflammatory disease or a previous diagnosis of endometriosis. 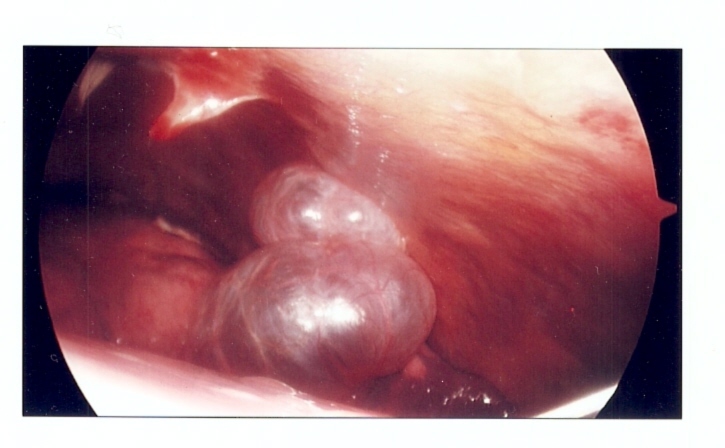 Thoracoscopic evaluation was negative for the presence of endometrial tissue, and there were no diaphragmatic defects. Final pathology: no abnormal results, confirming intra-operative findings. **Note: Since this is a blog, available for public viewing, patient permission was obtained prior to posting. All efforts are made to protect patient privacy, and thus details regarding patient demographics have been changed/ omitted. Also, our gracious thanks to the patient and family for allowing this discussion of the case. If you have an interesting, educational or informative case, contact Cirugia de Torax for publication. For additional information and discussion on blebs and bullae, see our related post here. Majak P, Langebrekke A, Hagen OM, Qvigstad E. Catamenial pneumothorax, clinical manifestations–a multidisciplinary challenge. Pneumonol Alergol Pol. 2011;79(5):347-50. Ciriaco P, Negri G, Libretti L, Carretta A, Melloni G, Casiraghi M, Bandiera A, Zannini P. Surgical treatment of catamenial pneumothorax: a single centre experience. Interact Cardiovasc Thorac Surg. 2009 Mar;8(3):349-52. Epub 2008 Dec 16. Sánchez-Lorente D, Gómez-Caro A, García Reina S, Maria Gimferrer J. Treatment of catamenial pneumothorax with diaphragmatic defects. Arch Bronconeumol. 2009 Aug;45(8):414-5; author reply 415-6. Epub 2009 Apr 29. Spanish. Just wondering if it’s pretty common to misdiagnose a burst bulla from x-ray and observation. My wife was presented to emergency department with a dry cough and some shortness of breath. An x-ray was taken from which it was decided that her (known) bulla had burst, then a drain tube was emeidiatly put into the bulla. When moved to the hospital ward the specialist sent her for ct scan and confirmed that the bulla had not burst and the drain should not have been put into it. Now awaiting surgery to remove tube and bulla. Unfortunately, it is easy to misdiagnose this condition on plain chest radiograph. (Air can look pretty much the same, whether contained within a large bullae or as a suspected pneumothorax. Sometimes, (not often) it IS possible to see intact bullae on a plain film but that tends to be in people with extensive bullous disease, thin frames (and high quality films). Otherwise, a CT scan is almost always needed for definitive diagnosis. However, with your wife’s history of previous bullae and her symptoms of SOB and cough, Chest X-Ray is usually the first step – and is appropriate, (no radiation, and CXR can be done very quickly). 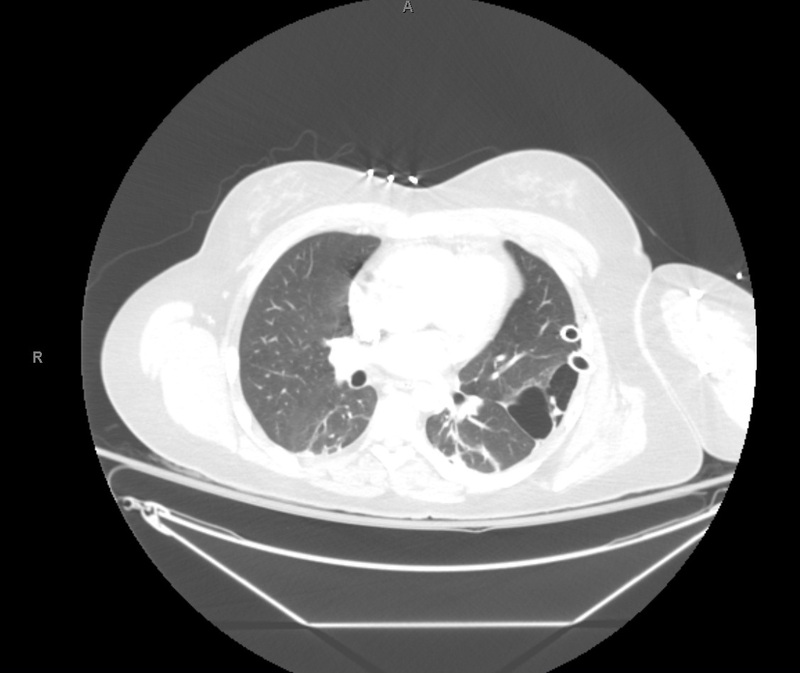 If a large pneumothorax is suspected by plain film (and patient is short of breath) putting in a chest tube was a logical next step to prevent further lung collapse. Unfortunately, medicine is not always a precise as we would like it to be, nor are patients all alike, so as specialists, our service is frequently consulted in scenarios very similar to your wife’s. Hope this information help – and a speedy recovery for your wife..